Popular ideas about happiness are misleading, inaccurate, and are directly contributing to our current epidemic of stress, anxiety and depresssion. 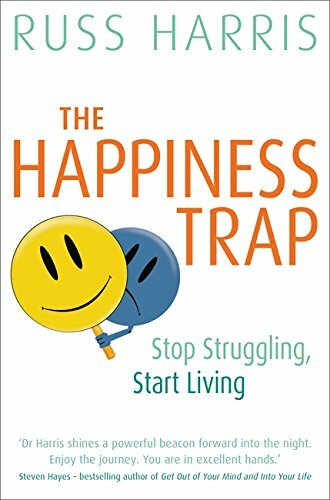 And unfortunately, popular psychological approaches are making it even worse.In this controversial, but empowering self-help book, Dr Russ Harries, reveals how millions of people are unwittingly caught in the 'The Happiness Trap', where the more they strive for happiness the more they suffer in the long term. He then provides an effective means to escape through a groundbreaking new approach based on mindfulness skills.Mindfulness is a mental state of awareness, openess, and focus., Mindfulness skills are easy to learn and will rapidly and effectively help you to reduce stress, enhance performance, manage emotions, improve health, increase vitality, and generally change your life for the better.The book provides scientifically proven techniques to:Reduce stress and worry.Rise above fear, doubt and insecurity.Break self-defeating habits.Improve performance and find fulfilment in your work.Build more satisfying relationships.Create a rich, full and meaningful life.